In my previous blog, I said that we think of recipes in terms of successes and failures, hence the phrase “keepers and poopers.” Or we think of them as recipes that we can cheat on by skipping a step or two, substituting ingredients or varying the temperature and cooking time. When we cheat on a recipe, the taste will be different, but chances are no one will ever know; that is if you don’t breathe a word about your naughty attempts. The only risk is the dish could turn out a disaster, bad news especially if you’re hoping to serve it to guests who are due in an hour. These are two pies that I made on different occasions. One is a raspberry tart which I made back in July and the other is a Dutch apple pie that I made three weeks ago when apples seemed to be everywhere. 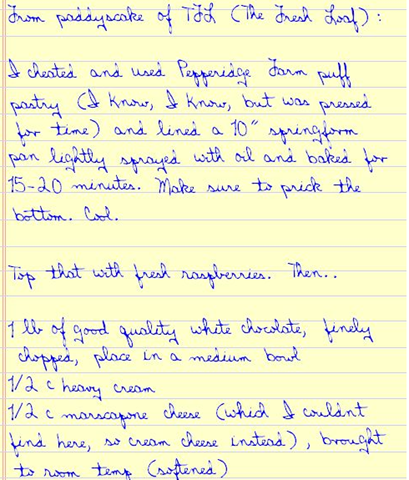 I cheated on one; on the other, I followed the recipe to the letter. Can you tell which one of them is the lie? 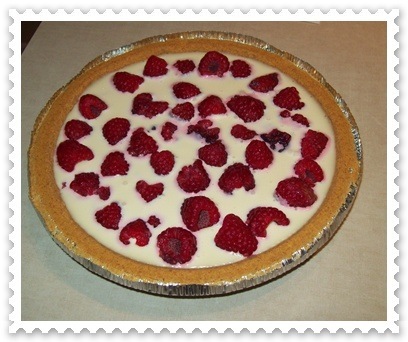 If you look closely at the raspberry tart – examine the crust – it’s obvious isn’t it? 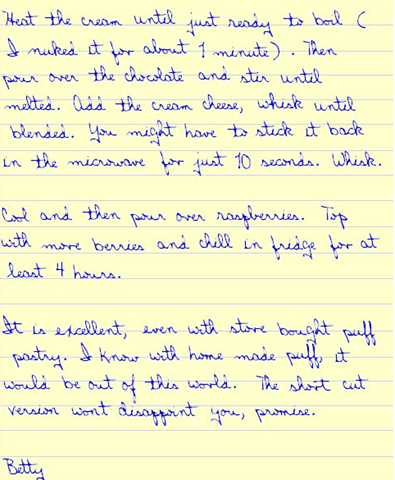 This recipe was posted by a fellow member on TFL – paddyscake. She said that the recipe called for mascarpone and a pie crust from scratch. She said she didn’t have time to make a pie crust so she bought a ready made crust from Pepperidge farm. She also didn’t have mascarpone cheese, so substituted cream cheese instead. Poor raspberry tart. It went through two rounds of foul play. When I decided to make it, I, too, gave in to the temptation of cheating. Paddyscake said that despite her substitutions, the pie was deliciously evil and to die for. I did buy mascarpone cheese because of my weakness for tiramisu, but at the last minute, I didn’t feel like making pie crust. So I used a Graham cracker pie crust that had been sitting in my cupboard for two months. Criminal. Tell me why I would buy expensive mascarpone cheese only to pair it with a ready made crust? There’s a disconnect, wouldn’t you say? Disconnect or not, the pie was heavenly. It didn’t seem to bother paddyscake, so why should it bother me? The combination of mascarpone and white chocolate jolts the palate. 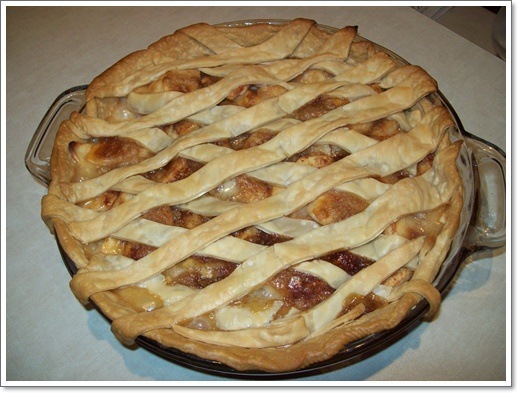 The Dutch apple pie is from Canadian Living Magazine (online version). It’s the perfect dessert to accompany a homemade meal. I’m not an apple person, but I always have a soft spot for apple pie or any dessert made with apples. http://www.thefreshloaf.com/node/12424/kalamata-olive-sundried-tomato-and-feta-bread (and scroll much further down). On a lightly floured surface, roll out pastry and fit into 10-inch (25 cm) pie plate; trim and flute edges. Peel and core apples; cut each into 6 wedges. Arrange wedges snugly in single layer in pie shell; drizzle with half of the cream. In a small bowl, combine sugar and flour; cut in butter until crumbly. Sprinkle over apples; dust with cinnamon. Drizzle with remaining cream. Bake in 450°F (230°C) oven for 15 minutes; reduce heat to 350°F (180°C) and bake for 30 to 35 minutes longer for until apples are tender, shielding edges of pastry with foil if browning too much. Let cool.